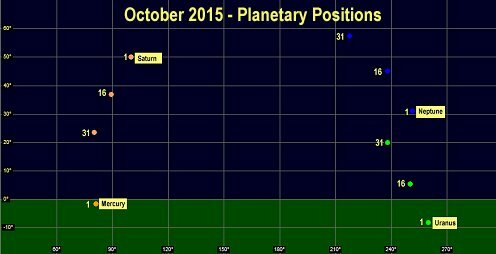 Early Evening planetary positions for the month of October 2015. MERCURY returns to the morning sky this month, but never climbs high enough above the horizon to be visible. VENUS is visible low in the morning sky, shining brilliantly as the "morning star". Venus has a very busy month with an occultation and several planetary encounters. MARS remains low in the morning twilight for most of this month. It may be difficult to see in the twilight at the beginning of the month. JUPITER climbs out of the twilight this month and has some nice planetary encounters. Venus, Regulus, Mars and Jupiter form a line in the early morning twilight, although it may be difficult to see Jupiter early in the month. SATURN was at opposition, when it was biggest and brightest as seen from Earth in May. Saturn remains a decent target for telescopes in the evening for most of the month, but comes progressively closer to the horizon. URANUS reaches opposition on 12 October and is therefore visible all night. 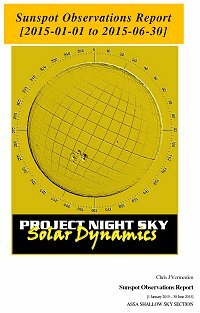 It rises above the eastern horizon at sunset, reaches its highest point in the sky during the middle of the night before setting in the west as the Sun re-appears. NEPTUNE continues to move very slowly retrograde in Aquarius during October. Despite the fact that Neptune has passed opposition, it still remains well placed for observation, visible as soon as it's dark enough and for most of the night. 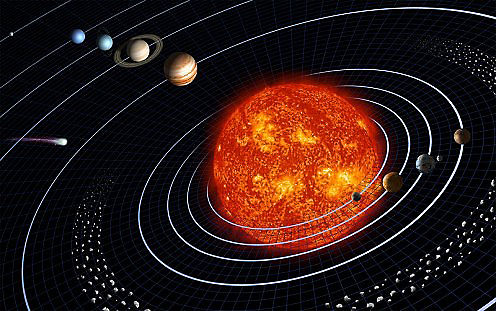 The Solar System is comprised of the Sun and celestial objects that gravitationally bound to it. There are 8 planets and more than 150 known moons. There are also currently 5 identified dwarf planets and their known moons. 1000's of small bodies including asteroids, meteoroids, comets, and interplanetary dust also form part of our Solar System. Interstellar gas or dust (also known as "solar nebula") is disturbed and it collapses under its own gravity. This disturbance could be caused by the shock wave from a nearby supernova. The cloud collapses, heats up and compresses in the center. As dust vaporizes, the center compresses enough to become a protostar. The centrifugal force prevents some of the gas from reaching the forming star and it forms an "accretion disk". The gas cools off enough for the metal, rock and ice to condense out into tiny particles. These dust particles collide with each other and form larger particles. Once the larger of these particles are big enough to have a nontrivial gravity, growth accelerates, and gravity pulls in smaller particles. Large objects have accumulated all of the solid matter close to their own orbit and their size depends on distance from the star and the density and composition of the protoplanetary nebula. Protoplanets take about 1 million years to form after the nebula cooled. The star generates a very strong solar wind, which sweeps away all of the gas left in the protoplanetary nebula. If the protoplanet was large enough, its gravity would pull in the nebular gas and become a gas giant - like Jupiter, Saturn, Uranus and Neptune. If not, it would remain a rocky or icy body - Mercury, Venus, Earth and Mars. After ten to a hundred million years, you end up with a number of planets, in stable orbits, and that's how a solar system is formed. As seen from the Earth, a solar eclipse occurs when the Moon passes between the Sun and the Earth, and the Moon fully or partially blocks the Sun as viewed from a location on Earth. 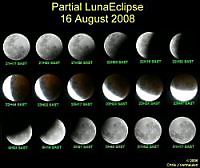 This can happen only during a new moon, when the Sun and the Moon are in conjunction as seen from Earth. A lunar eclipse happens at a Full Moon, when the Moon's tilted orbit brings it into the Earth's shadow, which can then be seen cast onto the Moon. hile not as spectacular as a total solar eclipse, a lunar eclipse is much easier to see; and a total lunar eclipse is an amazing and beautiful sight. There are 5 officially recognised dwarf planets in our solar system, they are Ceres, Pluto, Haumea, Makemake and Eris. With the exception of Ceres, which is located in the asteroid belt, the other dwarf planets are found in the outer solar system. Currently only Pluto is the only Dwarf Planet visited by spare probes - NASA's New Horizons Mission reached it July 2015.